Sending information in an email attachment is quick and easy to do but you need to be aware that there is a risk that someone could intercept your information if you choose this method. This can be particularly important if the data you are sending contains personal, sensitive or financial information. In order to minimise the risk we would recommend you encrypt your information before emailing it to us. Encryption uses a software tool to scramble and lock information into meaningless data for all except the people who have the key to unlock and descramble the information. The following provides guidelines on how to do this. 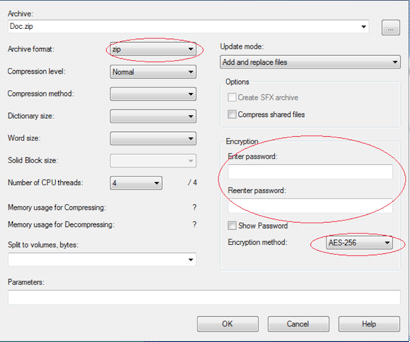 Another approach is to use a compression tool, such as 7-Zip, WinZip or WinRAR for example, is required in order to easily encrypt files. 7-Zip is an open source (free) tool and can be installed using default options. Other tools are available or MAc OSX and Linux platforms. Guidance can be found within this article. We also strongly recommend that a “strong” password is used to encrypt your files i.e. 15 characters long with a mix of uppercase, lowercase, digits and non-alphanumeric characters. This password should not be sent in the same email as the encrypted document(s). Your encryption is as strong as your password so you should avoid easily guessable words or phrases. Depending on which tool you use, you may need to enter your password each time you open your encrypted document so don't forget it. 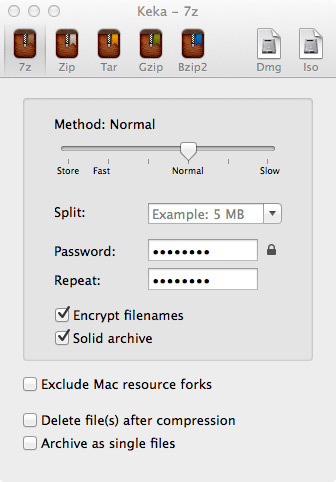 You will also need to send it separately to your recipient so they can decrypt your file(s). We recommend calling the recipient. We also recommend, especially for larger files, sending via BUtransfer, the Bournemouth University files transfer system. This offers a pick up and drop off files and a more secure alternative to standard emails, however we would still recommend encrypting your files/documents before it leaves your system. The instructions below assume you have 7-Zip on your machine and you are running Windows 7. There are unofficial 7-Zip packages available for non-Windows users, or you can use the free tools listed further down the page. Enter your password (We advise you make your password about 15 characters long, using a mix of upper and lower case letters, numbers and special characters). Then click OK. The rest of the options can be left as default. This will create an encrypted Zip (or 7z) file, in the same location as the original file, which can then be attached to an email as standard. As Keka doesn't encrypt .zip files by default, you will either need to use the 7z format, or enable a hidden option in the beta version of Keka. We recommend using the 7z format. Launch Keka and in the file type menu, select the 7z button. Drag and drop the file(s) you want to encrypt onto the Keka window. This will create an encrypted Zip (or 7z) file, in the same location as the original file, which can then be attached to an email as standard. The standard Archive Manager (File Roller) application included in Ubuntu can be used to create encrypted files using the 7z format. You will need to ensure you have the p7zip-full package installed (on some distributions it may be called p7zip). Select your file(s) in a file manager window, right click and select Compress. In the Compress window make sure you select the .7z format. You can also choose which directory you want to create the encrypted file in. Click Create to generate your encrypted file in your chosen directory. It can then be attached to an email as standard. Remember to tell your recipient the password to unlock the document but DO NOT include the password in the same email as your attachment. We recommend a phone call.